Bangkok has recently become the most visited city in the world; so chances are if you’re visiting Thailand, your first stop will be the City of Angels. It’s easy to get overwhelmed by the amount of things to see and do, with the contrast between the serene temples and the crazy hustle and bustle making it feel like you’re in two different locations at once. Although there’s an endless amount of culture and tourism in Bangkok, I felt that 24 hours was more than enough time for the city to make a grand impression. Here’s my guide to a short stay in Thailand’s capital! Bangkok has two airports, Don Mueang and Suvarnabhumi (pronounced ‘soowunnah-pboom’), with Don Mueang (DMK) handling most of the low cost airlines. When booking onward travel, make sure you double check the airport as it’s a bit awkward to travel in between the two! I flew with Emirates from London Gatwick, with a short stop in Dubai. 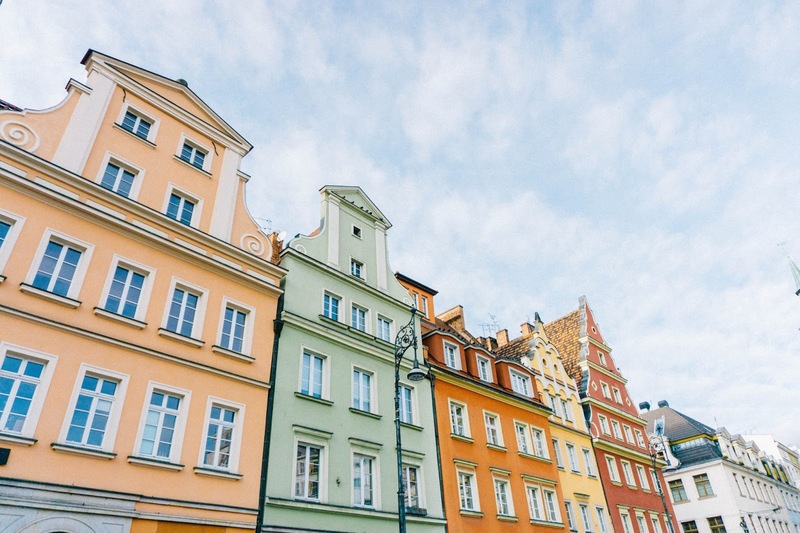 Have a look on websites like Skyscanner for the cheapest dates to fly and to compare the prices between airlines, as I managed to find flights that were at least £100 cheaper than when I first started looking! A lesser-known, but just as helpful tool was an iOS app, Hopper, which gave me regular updates and predictions on flight prices. The app recommends the best time to book, and whether to hold out on booking due to predicting reduced fares in the near future. 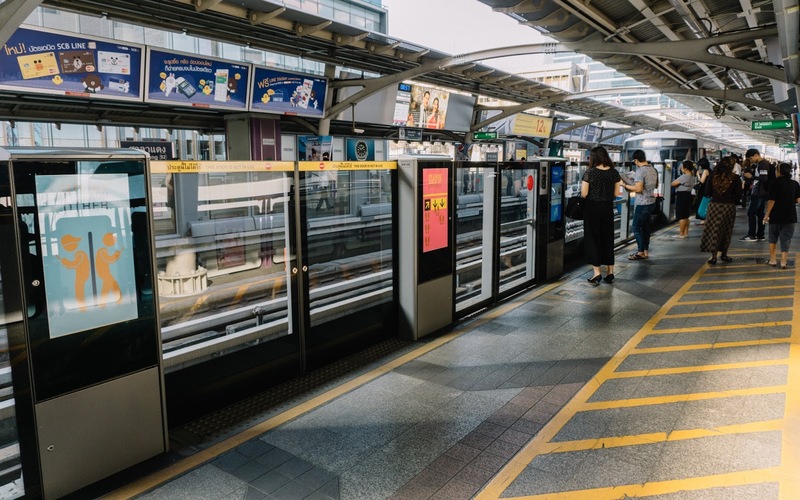 Travelling around Bangkok was surprisingly simple, with the BTS (Sky Train) service running in between most of the popular tourist attractions and places I wanted to visit. If you don’t fancy battling the crowds on the BTS avoid travelling this way at rush hour - I had to walk in backwards to make myself fit, with a local giving me an encouraging “let’s go!” when I hesitated to squeeze myself into a seemingly full carriage! 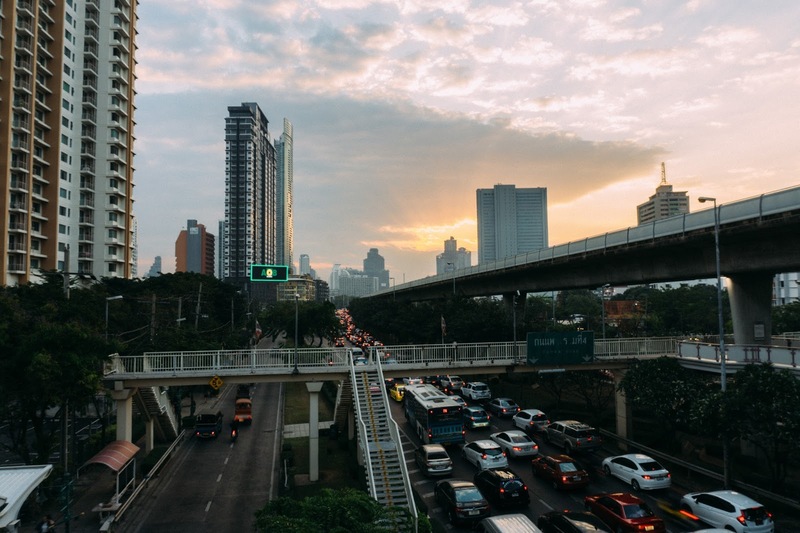 Travelling by taxi at rush hour will result in you sitting in standstill traffic, and take a business card with your hotel’s address written in Thai to prevent any language barriers or confusion. Watch out for taxi scams by making sure the driver uses the meter, most drivers will use it if you ask as they don’t want to lose your custom, but choose another driver if he refuses to do so. Tuk Tuks are good fun to have a small ride in, but be aware that the driver often gets commission by taking you to a gem store with overpriced and often worthless gems en route to your destination. As tourism continues to explode in Thailand, the amount of hotels and accommodation increases also. There’s something for every budget in Bangkok; Khao San Road is popular with backpackers and hostels, the Riverside area is home to 5* sky rise hotels, and there’s a seemingly infinite amount of hotels priced between the two areas available online. I suggest having an idea of what you want to see whilst in the city, and book somewhere nearby so you don’t waste time stuck in heavy traffic or travelling on the Sky Train. Although I booked my hotels as I travelled during my time in South East Asia, I definitely recommend booking something before arriving in Bangkok. The amount of choice is overwhelming, and there’s something comforting knowing that you have somewhere to freshen up and drop off your bags after the long journey. 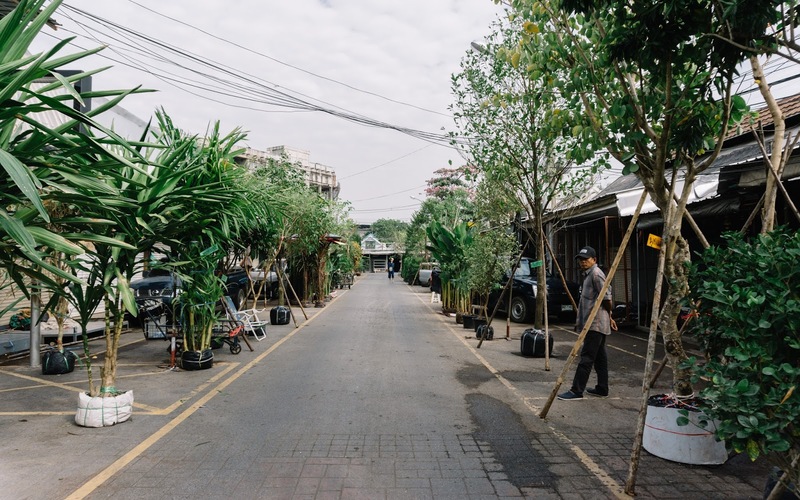 Whilst writing this post and actually jotting down what I did during my day in Bangkok, initially it felt like I didn't explore half of the popular attractions in the city. One of my favourite parts of the day was the morning; waking up to a sunrise over a new city whilst the air was still cool, in a city full of purpose and hustle and bustle. I was on a mission to get some breakfast; and enjoyed ambling amongst the sights and smells that the morning brought. I was brave enough to squeeze into a BTS carriage at rush hour, I walked past school assemblies and parents taking their children to school, outdoor BBQs with businessmen grabbing a quick breakfast, and locals praying with monks on the street corners. Although I didn’t actually do anything until later on in the day, my walk for breakfast was one of my favourite moments in Bangkok and really gave me a feel for the city. I had heard to expect slightly less crowds here than the more popular Grand Palace, so decided to head straight to Wat Pho (pronounced Wat Po). 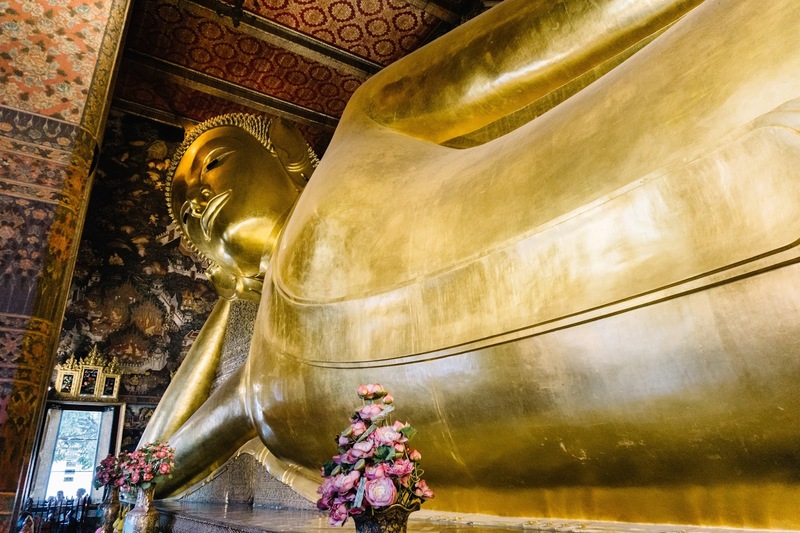 The site holds the city’s largest reclining Buddha and is a little area of calm in a city of chaos. The architecture here is beautiful and well worth a visit, and as well as being home to a school of Thai massage! I had looked forward to exploring the famous Chatuchak Weekend Market... Unfortunately I was a day early and the only things on sale were plants and flowers. Although the plants were beautiful, it wasn't quite what I was expecting! There were plenty smaller markets around the city that I checked out on the way past however, and if you are visiting through Friday to Sunday give the Chatuchak market a go - they sell anything and everything, from plants, clothes, to baby squirrels! I hadn't planned to end up in a shopping centre, but I was dying for a break from the heat (and to find a clean bathroom to be honest!). In contrast to the markets you find dotted around the city, Siam Square is Bangkok's equivalent to Bond Street in London or Fifth Avenue in New York. Amongst the countless designer stores, there's also showrooms for Porsche, BMW and even the new Lamborghini Huracan Spyder was on display - although I wouldn't be brave enough to drive a car worth that amount of money around the crazy streets of Bangkok!